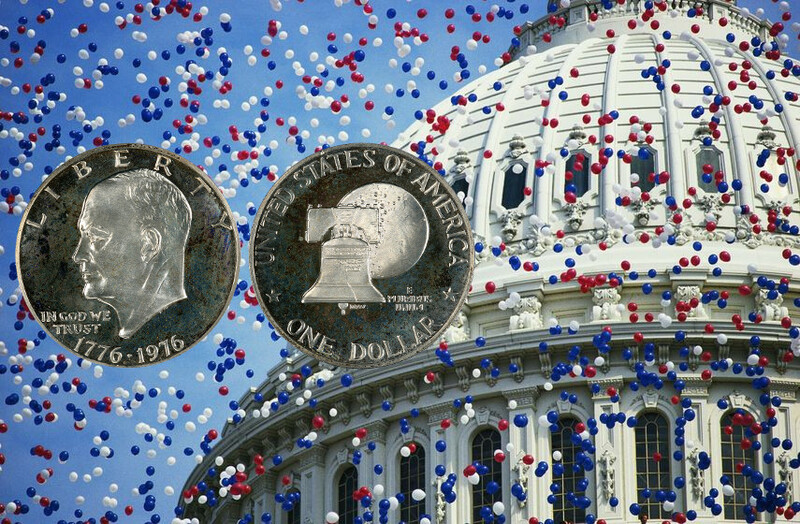 It may be hard for some to believe, but Bicentennial coins – the special U.S. quarters, half dollars, and silver dollars made in 1975 and 1976 to honor the nation's 200th birthday – are turning 40 years old. Surely, the mid 1970s seem like a distant past in many ways, having gone the way of disco, leisure suits, and shag carpet. But for more seasoned numismatists, it can seem like the trio of Bicentennial coins that hit pocket change four decades ago marked an event that happened perhaps just a few years ago. Bicentennial coins, which are dual-dated 1776-1976, date back to the early 1970s, when the American Revolution Bicentennial Commission proposed that the United States Mint honor the nation's 200th birthday with commemorative coins. The original plans called for the six then-circulating coins, cent through one-dollar coin, to bear special Bicentennial designs. However, there were concerns among some in the U.S. government that production of the new commemorative coinage would slow down the manufacture of circulating currency. Some officials were even concerned the Bicentennial coin program would open the door to the kind of financial abuses that brought down the nation's commemorative coinage program in 1954. After Congressional negotiations, a Bicentennial coin program was approved. Within days, a design contest was opened to the American public to select three new designs. The competition, which started in October 1973, closed in January 1974. By the time the contest ended, some 884 designs were submitted. 12 semifinalists were narrowed down to three final winners, including Jack L. Ahr's colonial drummer boy design for the quarter, Seth Huntington's image of Independence Hall for the half dollar, and Dennis Williams' superimposition of the Liberty Bell against the Moon for the dollar. Each of the winners also claimed a $5,000 prize. 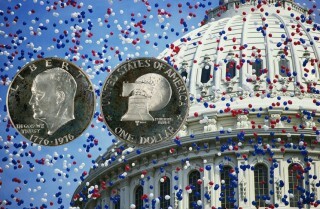 The first ceremonial strikes of the Bicentennial coins were made on August 12, 1974. By November 1974, the United States Mint began taking pre-orders for 40% silver clad sets, charging $15 for the silver proof sets and $9 for the silver uncirculated sets. As 1975 wore on, the Mint reduced the prices of the sets to $12 and $7 as customers complained about the original prices of the sets, which were deemed by many to be too expensive. The San Francisco Mint produced a total of 45 million 40% silver Bicentennial coins, a figure evenly divided among the quarters, halves, and dollar coins. These 45 million coins were assembled into 11 million uncirculated sets and 4 million proof sets. The copper-nickel clad business-strike coins, meanwhile, were released to the public in phases. Half dollars were the first coins to hit circulation on July 7, 1975. Next out of the gate were the quarters, which made their public debut that September. The dollar coins made their first appearance in October. Production of the business-strike Bicentennial coins continued through 1976. Interestingly, 1976 brought one notable design change to the dollar coin, which received revised reverse lettering that year. This led to the Type I and Type II Bicentennial dollar varieties that are distinguished by numismatists today. While copper-nickel clad dollars are seen in both types (Type I clad dollars were struck in 1975 and Type IIs were made in 1976), all 40% silver Bicentennial dollars were struck with the Type I die, which contains thicker reverse lettering than the Type II design does. By 1977, the quarter, half dollar, and dollar coin resumed their usual reverse designs and single-year dates on the obverse. However, the U.S. Mint continued selling the 40% silver Bicentennial uncirculated and proof sets into the 1980s. Millions of unsold silver Bicentennial coins were melted in 1982, though enough were left behind to sustain sales activity. Finally, on December 31, 1986, a full decade after the nation's Bicentennial, the U.S. Mint suspended sales of the 1976-dated silver uncirculated and proof sets. Today, Bicentennial coins remain popular with many coin collectors. However, these 1970s-vintage coins have been largely overshadowed by the plethora of newer commemorative coins, not to mention the 50 States Quarters, America the Beautiful Quarters, and multitude of special-issue commemoratives that the United States Mint has released each year since 1982. 40% silver Bicentennial proof and uncirculated sets can be bought for less than $20 each, though some of the best buys may be the high-grade certified pieces that register at MS-66 or better; in premium Mint State grades, Bicentennial coins are relatively scarce. Of course, coin collectors on a budget can always look through coin rolls for circulated 1976 Bicentennial quarters and half dollars. Also, some banks still carry Eisenhower dollars, which could yield Bicentennial finds among that series. Will Bicentennial coins continue to lure modern collectors? There's plenty of reason to believe that they will. While hundreds of millions of Bicentennial coins were made and therefore will probably never become scarce in terms of overall availability, as these coins continue aging, their nostalgia factor will surely only grow.